Gifts under $25 are a bit easier than $10, but not as easy as under $50. I feel like $25 is a good price point for hostesses and friends, so I tried to include items for those people! · Syrup Sampler: Super cute for a hostess gift. Pair it with some pancake mix that the hostess can cook up while nursing that party hangover! · Map: I LOVE the idea of placing this map on a corkboard and then adding pushpins for places that you’ve traveled! · Customized Paper Doll: You know how I kind of have a thing for paper dolls? Well how cute are these personalized ones! I spotted this find in Real Simple! · Tiffany Wine Tumblers: That blue box will thrill any recipient and also surprise people that you can get a gift from Tiffany & Co. under $25! · Suri’s Burn Book: LOVE this blog and saw the book the other day and it’s adorable! 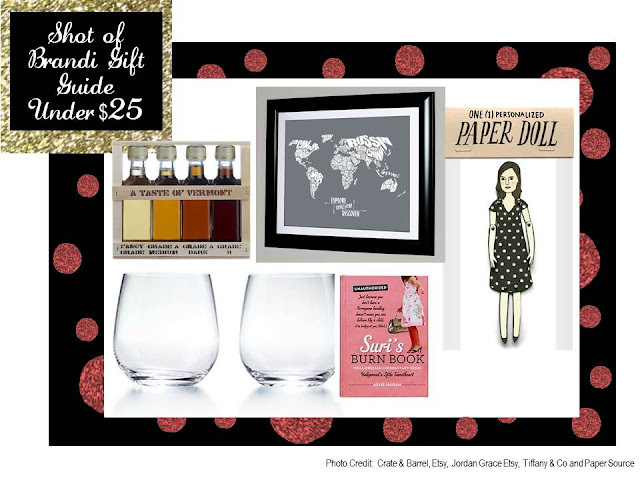 You have a great sense of design when it comes to gifting under various price tags. I feel delighted to watch the whole collection. I also like to share one such spot where gifts under $25 are listed.